Only a few people would remember Le Defense and Makati the same way people would know Paris and Manila. I know Paris is a million times more popular than Manila so comparing both cities as an entirety is a no-no. Tower or the Arc de Triomphe would top their list as their favorite Paris attraction. Although for me, I like Le Defense better. Makati on the other hand is Manila's main financial district. It is a separate city on itself but is part of the larger Metro Manila. Its kinda like a city within a city that is comprised of several other cities. If you would look for "Manila Skyline", chances are, you would get Makati's pictures. 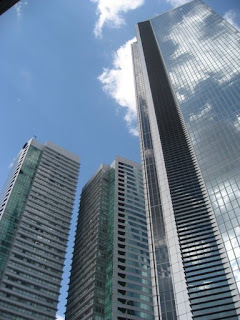 Anyways, skylines of both Le Defense and Makati are similar. Can you spot which is which? hmmm, im guessing the first pic is makati's and the last one is pari's. cause when i tried zooming the second pic, i saw one bldg there that has the word europe in it. could be the bldg's name. hehehe. am i right sir? why can't makati have a building that is named europe? don't the trees there look a bit tropical as well?